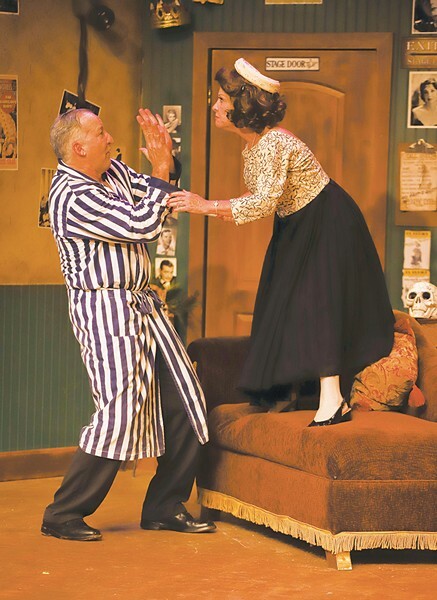 'Moon Over Buffalo' runs Friday–Sunday through Feb. 3 at 6th Street Playhouse, 52 W. Sixth St., Santa Rosa. Thursday, Jan. 24, and Friday–Saturday, 7:30pm; Sunday, 2pm. $20–$30. 707.523.4185. 6thstreetplayhouse.com. Theater companies love to produce theater about theater. 6th Street Playhouse gets in on the act with Ken Ludwig's 1995 door-slamming farce Moon Over Buffalo, running through Feb. 3. Buffalo, N.Y.'s Erlanger Theater is hosting the repertory company of George and Charlotte Hay (Dodds Delzell and Madeleine Ashe), grade-B actors and grade-A hams who never made it big onstage. Spending their waning years touring second-rate theaters and playing roles more appropriate for actors half their age, they're on the ropes when word comes that Frank Capra is coming to see them perform and possibly cast them as replacements for the leads in a big-budget period film. Charlotte doesn't believe George, as she's just found out he's been lying about an affair he had with company ingénue Eileen (Victoria Saitz). Charlotte announces she's running off with family attorney Richard (Joe Winkler), which sends George into a drunken spiral. Once she finds out the Capra story is true, it's up to Charlotte, her recently returned daughter Rosalind (Chandler Parrott-Thomas), her daughter's ex-lover and current stage manager, Paul (Robert Nelson), and Charlotte's hearing-impaired mother, Ethel (Shirley Nilsen Hall), to sober up George in time for the matinee. There's also confusion over Rosalind's current fiancé, Howard (Erik Weiss), who's mistaken by Charlotte for Capra and by George for Eileen's vengeful brother. Things conclude with a performance of Noël Coward's Private Lives mashed up with Cyrano de Bergerac. Director Carl Jordan has a terrific cast of comedic talents running, jumping and rolling through Ludwig's tale, which comes off as a lesser knock-off of his superior Lend Me a Tenor. All the elements are there (mistaken identity, feuding lovers, etc. ), but at its core, it's a hollow re-do that starts slowly before hitting its stride. More problematic, the characters as written simply aren't very likeable. The show only works if you care about the characters and want them to get out of their mess. I just didn't. The cast is game and their timing is great, with each squeezing some laughs out of their characters. Delzell gets to play half the show soused, Parrott-Thomas is quite delightful as Rosalind, and while Weiss' physical comedy is always fun to watch, I'd really like to see him do something different with his next role.